I'm excited to be introducing Elementor v1.9, which comes packed with Autosave, and several other UI features to help streamline your workflow. "Hey, what the #[email protected]&%*! did you do with my save button?" I know, receiving interface changes can be a tough cookie to swallow. It might be difficult to get used to the changes, but I guarantee that a couple of hours after using it – you’re going to fall in love with the new version! Today’s new Elementor version 1.9 introduces such changes. This is the first time in over a year and a half, that our panel gets a major update. We are making these changes because Elementor’s capabilities are constantly growing, and the interface has to match that growth. To achieve this, we need to continually innovate and improve core elements, to allow creators and designers to stay ahead of the game. We never cease to add cutting-edge features, while ensuring everything runs smoothly for all users, not only for the current version, but for future versions of Elementor as well. Every change was meticulously considered from every angle, and was added based on our users’ feedback alongside our own vision. It took us three months to ship the best solution, releasing version 1.9 following extensive testing by our team and beta testers group. Let’s dive-in, starting with the brand new Autosave feature. 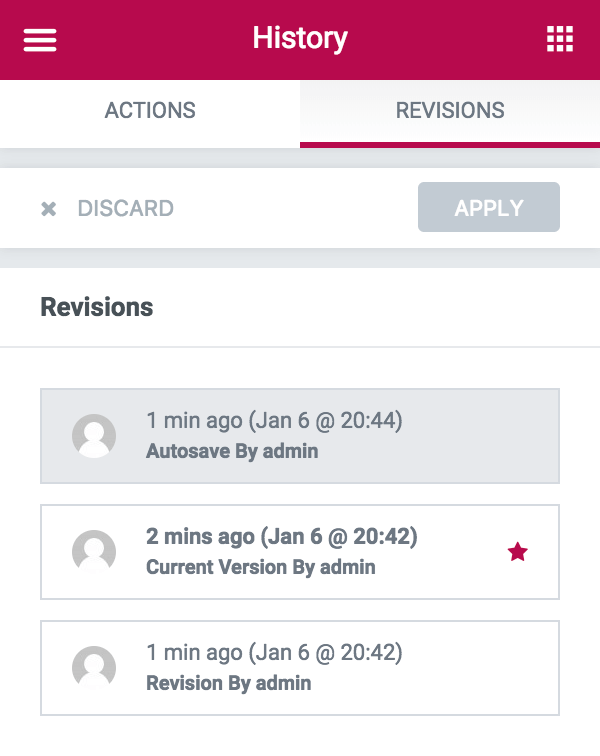 In the past, we added two powerful features that dealt with backing up your work: Revision History for saving a revision every time you save the page, and Redo / Undo for quickly undoing any mistake. Now, we are are adding a feature that will bullet-proof your workflow, making sure your work is always protected. With the new Autosave feature, every change you make gets saved auto-magically! This way, you’ll NEVER need to press save again! With the New Autosave Feature, Every Change You Make Gets Saved Auto-magically! Not Just Autosave... Auto-Draft As Well! Every post should look perfect, right? Remember when you were in the middle of editing an article, and visitors saw the changes before you were done? No more! Now, you have a new ‘Draft’ status for published posts. With this feature, you can continue editing your pages without having to worry about your visitors (or Google) seeing your unfinished work. This makes your workflow more flexible, because you can revisit your published articles, and tweak them without fear using your new ‘draft’ playground. You are editing a page that has already been published. All of a sudden, you get an urgent call. You have to leave your desk, but the changes you’ve made are not ready yet and you can’t publish. What do you do? Do you publish your incomplete changes, or discard them completely? Right here – our new ‘Publish / Draft’ feature comes to your rescue! 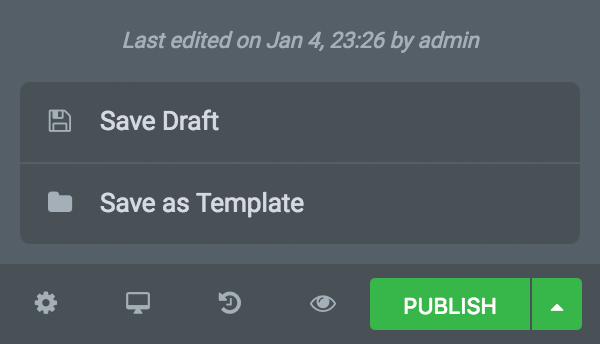 Instead of having only one published live version to work on, you now have two versions: the published version that your visitors see, and another NEW draft version that you can work on. From now on, whenever you edit an already published page, you will in fact be working on the draft. ONLY when you are ready to publish the changes, hit ‘Publish’ to get the changes up and running in the live version of the site. The new Autosave and Auto-draft features made Elementor’s old save button redundant. We wanted to maintain your previous design workflow, while making it better. This is why we’ve replaced ‘Save’ with ‘Publish’ on new pages, and ‘Update’ on existing pages. You can publish pages straight from the main panel, or open the saving options to save the page as draft or as a template. The new buttons are similar to WordPress’s publishing buttons, offering you a more consistent experience. In WordPress, you first click on publish, and from then on click update to make changes to the published post. Moving on with our UI improvements, we’ve restructured our Footer Panel and Panel Menu. The panel menu, located through the left hamburger icon, now only contains general default settings (default colors & fonts, color picker, global and dashboard settings). We’ve transferred other settings, in order to make it easier to navigate in Elementor. This panel also contains the ‘Exit to dashboard’ button. This top-left position is in accordance to where exit button appear in most software (like Photoshop). The bottom-left footer button now links to Document Settings. This way, all your document settings are separated and are more easily accessible. This will prove more useful once we release our theme builder, and open Elementor to documents other than pages. Finally, the footer now has a Preview Changes button to let you see your draft before publishing your changes. 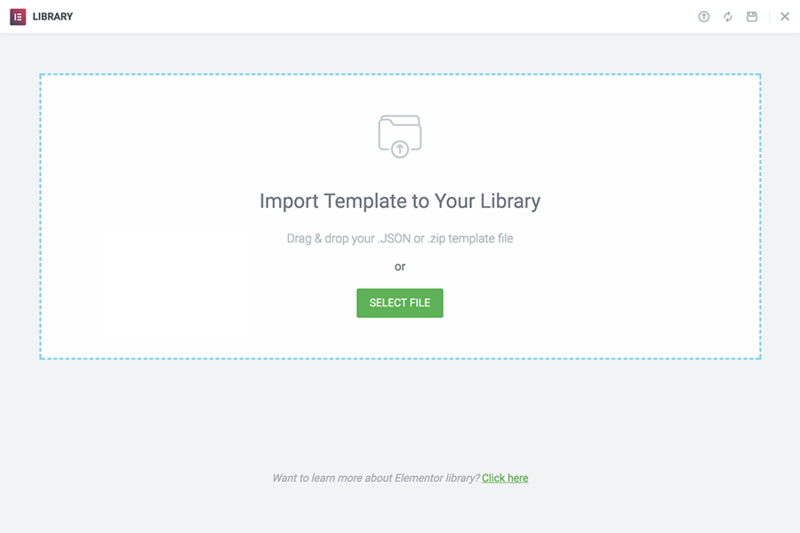 We have now upgraded Elementor’s Template Library, so it’s now significantly easier to navigate and sort templates in terms of functionality as well as UI. 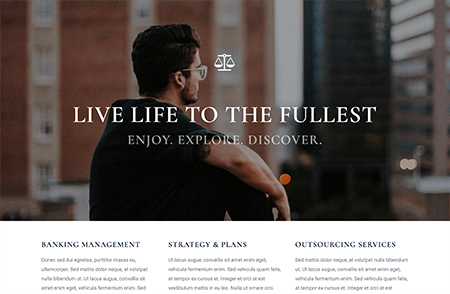 The Elementor Template Library has consistently grown since our launch, and now holds over 130 different stunning templates that help you create a wide variety of pages (landing pages, about, homepages…) across different industries (real estate, restaurant…). As we continue to add more and more templates, it has increasingly become challenging to find a template for a specific purpose or need. This is where the new Template Library is helpful, adding search and sort capabilities. You now have a template search box, so you can find the right template faster than ever before. We added relevant tags to each template, so you can also search for a certain category like ‘Sport’ or ‘Food’. So now, you can search by page, name, keyword tag or purpose. 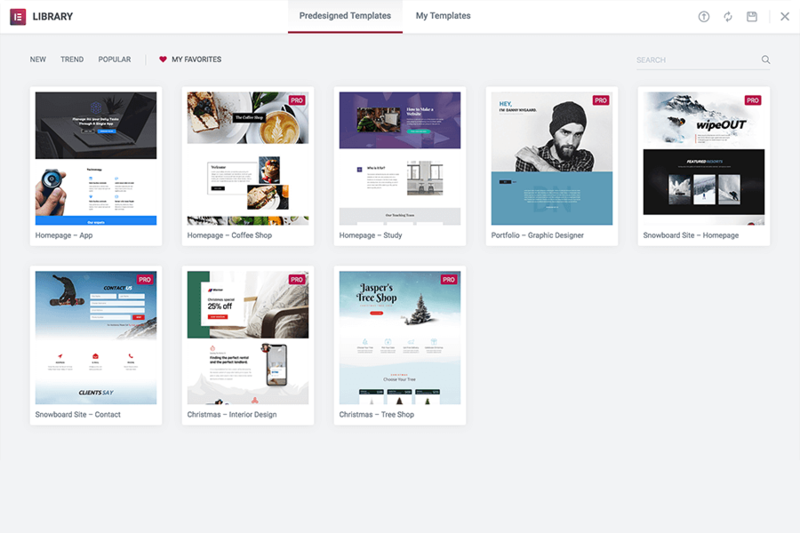 These filters help you find the leading templates, so you can leverage our community knowledge and take advantage of the ‘wisdom of the crowd’ to help you pick the right layout. The heart icon next to each template lets you save any template to the ‘My Favorites’ tab, ensuring easy access to your most loved templates. This way, you don’t have to browse through the templates or perform a search in order to find templates that you frequently use. "Find the Right Elementor Template Faster Than Ever Before." Under ‘My Templates’ tab, you can sort your templates according to: Name, Type (page / section), Author and Date. You can also filter your saved templates by using the search bar. Looking for a specific template you previously saved? Just enter any term in the search bar to quickly find and use it anywhere. Quick tip: When naming your templates, be as descriptive as possible. Include the purpose, client name, functionality, design concept and other attributes that might help you locate it later. We added the ‘Import Template’ functionality to the ‘My Templates’ tab, so you can import templates directly from the Library popup. 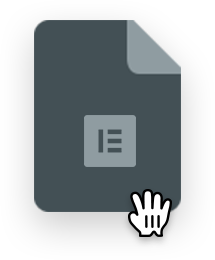 Drag your templates into the window and they will be uploaded automatically. We also added the ‘Sync Library’ and ‘Save to Library’ buttons. Previously, these buttons were only available under the tools dashboard. These changes came directly from recurring user feedback, that wanted an easier way to access these functions. The past year, our panel was introduced with many new features and additions. Some of our users felt the panel was ‘overcrowded’ and confusing. As a result, we started working on more advanced controls that made things easier. The result is a brand new popup control for typography, box shadow and text shadow settings. If you edit any text widget, you will see that these settings have now been placed inside a popup window. This change will help you get better focus when customizing style settings. This version introduces a new Elementor Overview widget into the WordPress main dashboard, making it more convenient for users to create a new page with Elementor, access recent documents and read about newly added feature updates. This change is especially helpful to users who use Elementor daily. 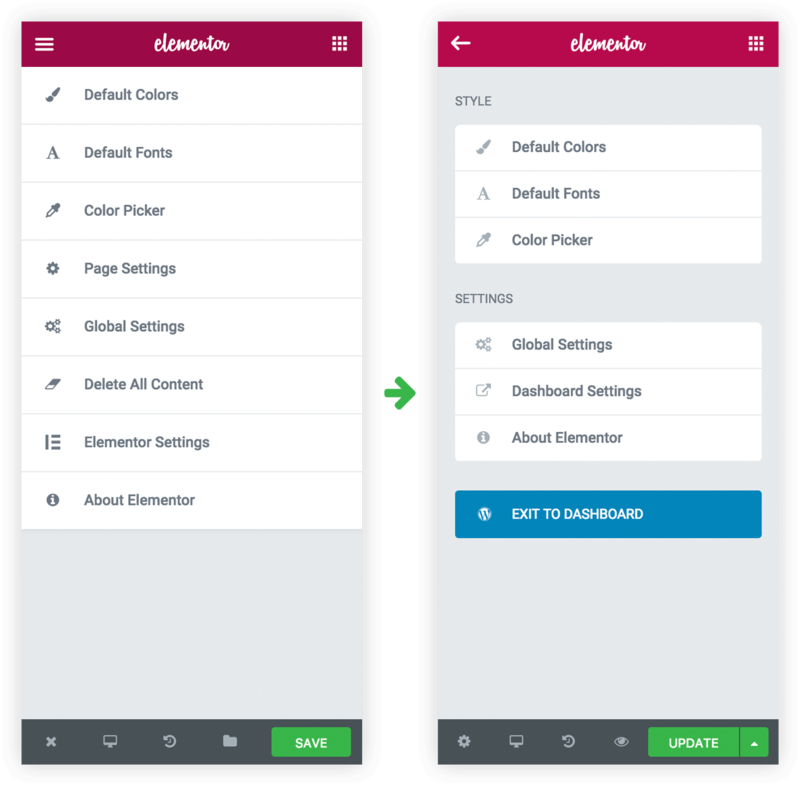 Instead of creating a new page, naming it, saving it as draft and finally clicking on ‘Edit with Elementor’, you can now click on the ‘Add new page’ and go straight to Elementor. Kickstart 2018 With a Bang! We are happy to introduce this new functionality to our (almost) half a million users. Elementor Version 1.9 includes several other improvements, including added Gutenberg compatibility, privacy mode for the video widget and other development improvements. You are invited to visit the Changelog for a complete list of changes. 2018 promises to be a big year for Elementor and its community, potentially reaching millions of users and rolling-out exciting never before features. What other capabilities would you like to see inside the Template Library? Let me know in the comments below. Great stuff. Love what you’re doing. Very good, thanks. I wish you a happy new year. Thanks a lot for the updates Ben, Happy New Year you too. Updates look good. Very pleased with the weekly/monthly updates and customer service. Keep it up. Very very cool update! Thank you so much for such amazing product. You guys are rock on the market! Amazing stuff as always, thx Ben and Team! Always amazed at what you guys come up with next! Can’t wait to find out more about the theme builder too! I love elementor, i love elementor, i love elementor. Thank you for your hard work. Here’s a sample of what you can build with Elementor! A way to edit light boxes like creating a page… not just for a photo or video pop up. Opt-in forms and such! Page split testing would be amazing! A timed auto reveal option for sales pages where you want but buttons to only show after a set amount of time. Thank you guys for an already fantastic plugin plus really wonderful new features you have added. Elementor completely blows away every other page builder out there! Thank you so much for all of these new features. Wish you all another great year! Nice improvements. Keep on the good work! Love all of this! Would love the ability to Favorite My Templates as well so I can star/heart the ones I use on sites that have a lot of templates I have custom saved. But truly love all these updates. Keep it coming!! In the meantime I would suggest naming your favorite templates differently… Like with a starting *Love This* note. This way, you can use the new sorting option to quickly sort and find them. It would be great to have a global setting/switch to open MyTemplates first instead of the predesigned Templates, when entering the Templates Area. Very food job. I AM new in elementor pro and really like it, waiting for updates for woocommerce. Thanhs, and happy new year for your team. Thanks for the updates. 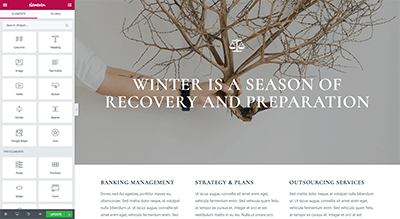 Love the ease of building a great site. really like the update with all its features, especially the settings popup as it recently got harder more and more to keep everything in focus (resp. in the panel). autosave and draft function also is a great improvement even if it may take some more time to get used to the new exit procedure. but still would like to see the own templates first when opening the templates popup. really anticipating the big pro update for templater, custom queries and stuff. my hunger is growing :-). Would be great if we could use elementor in order to modify the dashboard too. 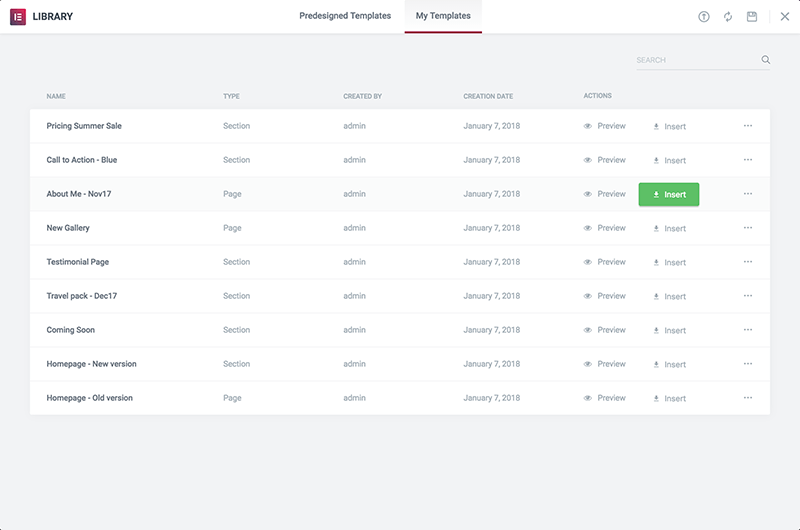 Another thing I’ve wondered about since working with Elementor: when I’m developing a site, I usually want to re-use (parts of) templates in “My Templates”, not templates from the “Predesigned templates”. I know, it’s just 1 extra click, but I find it annoying that “My Templates” is not the default tab. I could not find the option “view the page” as in the past versions. Is it to be reintegrated to Elementor? Awesome new stuff! I´m new to Elementor and just started my first project with. Good choice – love it! Cool. How do you get the update for Elimentor Pro? Just an awesome update, Seriously No.1 page builder 🙂 Happy New Year. Looks good. I’m digging the the auto save feature. Just went Pro because Elementor ROCKS . Thanks for the ongoing improvements. Love these updates! You totally read my mind about being able to search for templates. All of WordPress widgets no longer working when trying to edit a new page. Can’t upload videos images. New PRO user, former BB user, really like everything except wish we had the option to put a word “Menu” or something in place of the hamburger icon toggle for mobile devices. Yes. This is a good idea. Or the option for both. The changes and renovations are excellent! Your enthusiasm is contagious. It has been a great help to be able to experiment with the beta versions, it allows to move to the production phase with greater security, and makes possible to take advantage of new functions quickly. Thanks a Lot, Elementor Team!! We couldn’t have asked for a better response, thanks! Now, where did the predesigned templates go? I like the UI improvement and the Draft version is clever!! Thanks Jatupon, that means a lot! This I was looking for! Was used to the folder icon in the footer of the control panel. We are already 9 days into the New Year 2018 and the doors are flying wide open to more more thought out easy to use tools of endless possibilities! I wouldn’t have it any other way! Elementor is the “Ultimate Pro” for Page Building Success! Elementor is my preferred builder for pages. I’m counting the days for launching the builder theme. My dream is to be able to perform all the tasks of the WordPress front-end editor without having to use the WordPress back end, change the highlighted image, tacgs, schedule posts and other things that we set up in the back end. 4) Moving the Template Library to the sidebar so I can quickly build pages modularly using Section Templates. Image previews would be awesome. I must say – I LOVE Elementor and it’s currently my go-to editor for all things WP. Keep up the great work! Great work. A section tree would be nice. To easily drag and re-order sections within the tree. I seem to be having the same problem as frizzel77. Just looking into it now. Maybe a caching issue? Anyway, I do love Elementor Pro and am very excited about all these new features. Thank you very much Elementor team! One thing though, how do I edit the page (not section) background now? Would be great for mobile adaptive plugin for editing websites on mobile phones on the go. Sounds interesting, going to update it now, although I’m a bit scary with the UI improvement. But I guess it only a matters of time until we got used to it. So many lovely improvements here I didn’t realise I needed…. till now. 🙂 Well done team Elementor! Great Plugin Ben, I just fall in love with this plugin and ditched Visual Composer completely which was really tiresome. Thanks for building such an Amazing and useful plugin. A color picker would be a nice feature so you can match font or background colors with images. Now I have to go to photoshop to find the hex code. I use the ColorZilla plugin. Good job (again). Happy new year to you, Ben and Elementor team. I looked at the “Year in review“ page from Yoni. Impressive year. And impressive page. The sticky calendar menu is really interesting. Also the very top of the page with the background, the overlay and the sliding covering of 2017 are interesting and inspiring. But hard to exactly imagine how all this was made. I agree since you aready have a link setting in your app config, it’d make life quite easier by a lot. any clue if there is a plan for it? when i am creating a new post in WP then go to edit with elementor but which is not show in edit post. plz help me how to solve this issue……. This might be a theme conflict. Please contact our support. You worry a lot more than launching new widgets, you worry about our usability and that’s incredible! Every day I fall in love with Elementor! Congratulations on the excellent work. Where did the settings you moved go to? I can no longer find page settings. You guys are amazing. Thanks. Make me more productive without being a pro at this stuff. Once I installed the new update to Elementor v1.9, when I went to edit in Elementor, it would just spin and spin. I went back a version and everything was fine. Went back to v1.9 and after some trial and error, I removed this Remove Query Strings code from code snippets and now everything works fine. Not sure who to take this up with. If Elementor wants to look at it, the code for the remove query strings is at the link above. Not sure why it would cause this problem, but I definitely traced it down to that particular plugin and lines of code. How do I access my library while building the page in Elementor? I’m a newbie 🙂 but can’t figure it out! Very impressive again! One question and a few suggestions below. Question: is it normal that switching from WordPress to Elementor is taking a few seconds (say 5-7 sec)? I work with Chrome and experience this on two different server environments. Thanks for paying attention to this and keep up your good work! A few seconds is OK. I think that comments should not be ruled out in a language as widespread as Spanish. Thanks Jose. We have audiences in a huge array of languages. Sticking to English is the only way we make sure every user can read everything on our site. Hey i just started using Elementor with Astra to make a photography website for one of my clients. I was a little disappointed that you didn’t have any pre-made templates for a photography-type sites. The gallery is a little disappointing too in that you can’t custom choose the size of the thumbnails and have to crop all the pictures before selecting them for the gallery. But I really love everything else about it and hope to use it for a long time! Regarding the gallery, if you check out the new Media Carousel widget you can notice a lot more flexibility in terms of sizing and cropping. This will be introduced to the image gallery in the future. Any one triede switching to wordpress editor, lost all my content when i did it? Yes. This. I currently use Colorzilla tool in chrome to match hex, but I would love to see this integrated into Elementor. It seems like such a small thing, but it really would make my workflow faster. Ok sounds great! Also would it be at all possible to have low resolution images in the gallery and a high resolution image load for the lightbox? It would really help with load times! And retina compatibility would also be huge ? My website is coming along pretty well thanks to you guys??? I exit Photoshop only once or twice per day while I exit Elementor several dozens of times per day. The Elementor exiting functionality should NOT be in accordance to most desktop software. Elementor is NOT a desktop software and should allow for a swift workflow, not try to thoughtlessly mimic other software. Thanks for the feedback. The exiting function was two clicks before and it is two clicks now. We will continue to monitor all changes, but this change has been made after a lot of consideration. We keep improving the product, if you go back to the first version you won’t believe the improvement, yet upon every improvement followed some disapproval. I understand that changing how you work with software is a difficult adjustment, but have confidence in our team to lead Elementor forward with improvements. If this is the final Elementor’s Team decision on the Exit functionality then be it, I won’t pointlessly argue on a usability topic. Ben, LOVe the new improvements…ONE THING 🙂 It seams the dashboard button has been removed from the footer. I go straight from dev to dashboard alot and going to preview then dashboard seems like an extra step. Forgive me if Im just not seeing it, or its moved somewhere else…thanks! The feature of the search in the library was amazing … but now I have a suggestion that each template be divided into sections, so that if one liked a section of a template, download only that particular section and not all the template. Likewise, when one looks for all the sections that match that search regardless of whether they are separately or within a template, there will be more options to choose from. Please please create a way to block the templates and design elements in the backend for EDITORS so they cant mess up the page. Can you create something so that they can only edit the content (text, photos, videos) and not the layout or templates? This will be available at a future time, we’ve already started working on it. Hi. My code seems to have broken with the new update. Specifically, box shadows are not showing up. Is there a way to report a bug? First I would ask if others ran into this problem in the Elementor community on Facebook. It might be a bug because of a certain conflict on your specific website. Great improvement! I suggest you to add section templates in template library. It will be more easy to build page fastly with this option. I hope we get an option for masonry in the galleries. Your description is misleading and mentions masonry as an option on the pro version. We bought it and had the surprise that masonry is actually only available for posts not for galleries which would truly benefit from it. So we are not able to use it for our websites which are all photography oriented. Very sad for this purchase and the misleading descrition. Elementor has been great, and overall I love the new changes. But… seems I’m no longer able to use it with Firefox??? The “update” button is gone. It still shows in Safari, but not Firefox any more. Thank you so much for Elementor and all your work on improving it!!! Would be great to have a VC templatera-like template areas, if possible. this a great cause loving it and the site is wonderful what you did and what you are doing in the world… blessings wow!!! Your notification on my admin page says that v1.9 is now available. I do not think that v1.9 is younger than v1.93 ?? I forgot to give you my website address. ‘m not sure why, but since the new update when I go to make a new post with elementor instead of the title that I can type in it puts Elementor#812 or some random post number. I am unable to edit the title unless I exit elementor and use the regular (arg!) WordPress editor. I then bought PRO thinking this might be a glitch, but elementor is still auto numbering my posts. I don’t want elementor to assign its name to my posts on my website, especially after paying for PRO. Any ideas? Impressive site design. gives me all kinds of inspiration for how i want mine to look. Currently information is scattered between many (100?, 200?) web pages and blog posts. The disconnected, and often obsolete, information makes it hard to find what I want. Technical support is excellent, beyond what I expected. BUT I do NOT want to suspend work and wait a day for someone to answer a simple question. I think for your own development work you would need a central source of all user interface conventions, definitions of terms, features, and options for each feature. If no documentation exists, I find it impossible to develop and maintain a complex system. I would rather have documention than Restaurant templates, Call to action widgets, Christmas snow effects, Black Friday Design Kits, Black Friday marketing ideas, Halloween icons, Halloween design tricks, Construction Company Templates, Testimonial decorations, and "Animated Headlines." Thank you for the clever solutions and ideas you have developed. I DO appreciate them. But is it too much to ask for your to hire a good technical writer who can organize and clearly document your software's features? I hope this conveys my gratitude. I hope the words in my request convey constructive criticism. I LIKE Elementor. Awesome! Auto save a lot of hours of work. A lifeguard! Yes. This is a good idea. Once you have a site built and templates saved, you don’t need to go to the pre-designed templates any more. Auto save doesn’t work half the time. I have the updated version of Elementor and I have no option to save otherwise. This is extremely frustrating as I have had to redo work over and over.